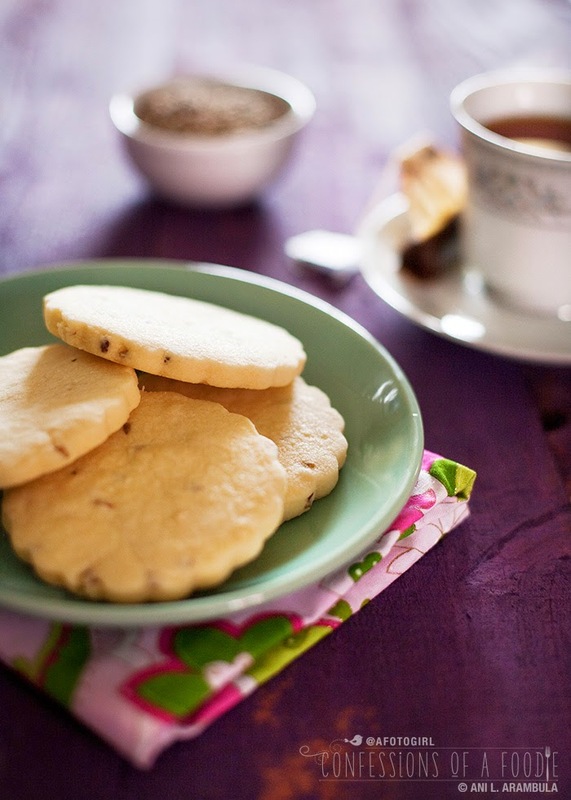 How to make lavender scented shortbread cookies perfectly every time. To welcome spring (yay!) I thought I would share my favorite springtime cookie recipe with you. 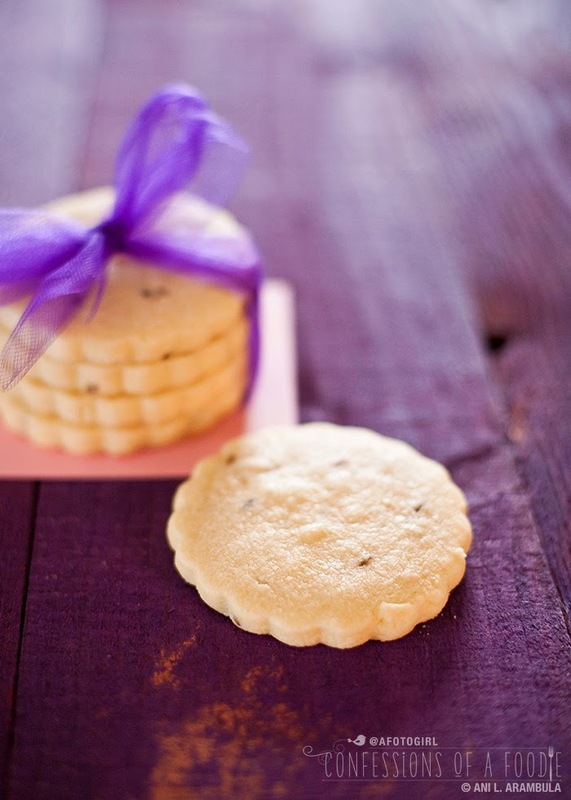 Every time I make a batch of these Lavender Shortbread Cookies, the sweet smell of lavender perfumes my entire house. This recipe was a welcomed by-product of my experimentation with dried mild pink flowers of a Melissa lavender plant that I brought back from a visit to Sunshine Herb and Lavender Farm in Sequim, Washington a while back. When I bought the Melissa lavender, I actually already had a little jar of brightly colored culinary lavender in my pantry at home bought our local farmer’s market. “Culinary-grade lavender buds” was the ingredient listed. I was over the moon to have found this little jar because I'd been wanting to add culinary grade lavender to my collection of spices. However, wandering around the culinary aisle at Sunshine, I found that there are actually several culinary varieties of lavender to choose from. Some apparently are best for coffees and teas, others are best for savory cooking, and still others are best for baking. Having that little farmer's market bottle at home with its vague ingredient listing, I opted to buy the 3 cup bag of Melissa which is sweeter and milder than Royal Velvet and the even heavier, camphor tasting, Provence. Baking lavender in hand, I chose to work out a shortbread recipe to rival the lavender shortbread I love at my local go-to place for an evening of coffee and desserts. Ever since that first bite years ago, I have been wanting to try my hand at making the cookie at home. It took several expensive tries to get this right. The first time around was an epic fail. I had researched for days probably reading through more than two dozen recipes for various infused shortbreads. 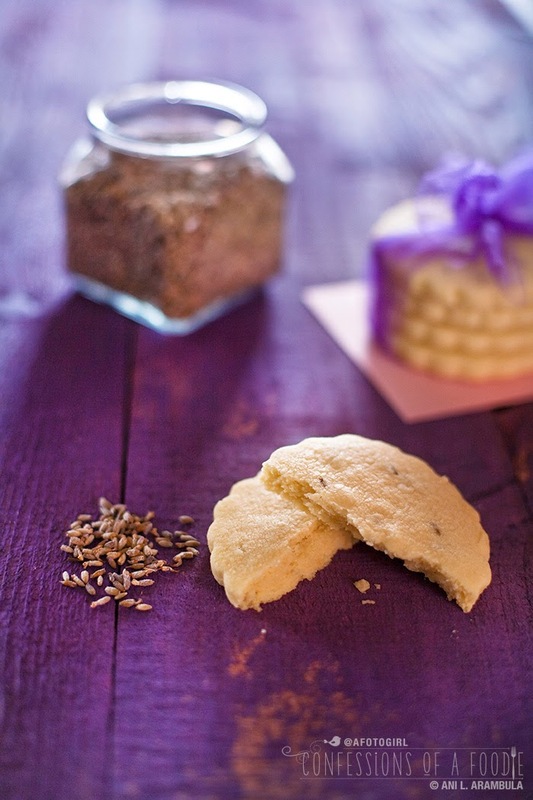 The preferred method for infusing the lavender common in all of the recipes I came across? Grinding 2 teaspoons of dried lavender buds with a tablespoon of sugar and then pulverizing the heck out of the buds. Do you know what happens when you chop herbs? Their essential oils come out. Do you know how much essential oil 2 teaspoons, pulverized beyond recognition releases? EPIC FAIL amounts. Biting into a cookie from that first batch was like biting into a bar of lavender soap. Yuck! So, I wound up tossing out my research and going with my gut. The result? While not exactly Extraordinary Desserts quality, these cookies are quite tasty and considering that the ingredients to make an entire batch of cookies is less than one cup of coffee and a single (albeit, huge!) cookie at the restaurant, I’m more than delighted at my creation. So, too, by the way, are my co-workers. My biggest lesson learned? A little goes a long way. I mean, seriously. It’s a fine line between yummy and eating your body lotion. I read somewhere that cooking with lavender is like cooking with vanilla: you might not necessarily be able to taste it but you know it’s there and life is a little sweeter because it is. The next lavender adventure? Lavender pound cake, I think. Oh, wait! Maybe lavender scented roasted chicken. Hmm, I wonder how lavender would taste in salad dressing? So many possibilities! Get yourself to your local farmers market this weekend, pick up some lavender and get to experimenting. You'll have perfected something just in time for Easter. I want to know all the wonderful ways you’ve come up with to use this sweet smelling herb. Cream butter and sugar either with a mixer on medium. Add vanilla. In a separate bowl, stir together the 2 cups of flour, cornstarch and salt to combine. Using a wooden spoon to mix, add to butter mixture a third at a time mixing after each addition and adding the lavender when you add the last of the flour. Dough will be crumbly. Spread a teaspoon of flour on your work surface and turnout the dough. Work the dough into a ball. You don’t want to over handle to dough so work quickly. Once it holds a ball form, rub some flour onto a rolling pin and roll out the dough to a 1 inch thick disk. This will help it to chill faster and will make rolling out the dough afterwards easier. Wrap dough tightly in plastic wrap and chill for 30 minutes. Line a cookie sheet with parchment paper or use a silicone baking mat. Spread a teaspoon or so of flour onto a clean dry work surface. Roll dough to about 1/4” thick. 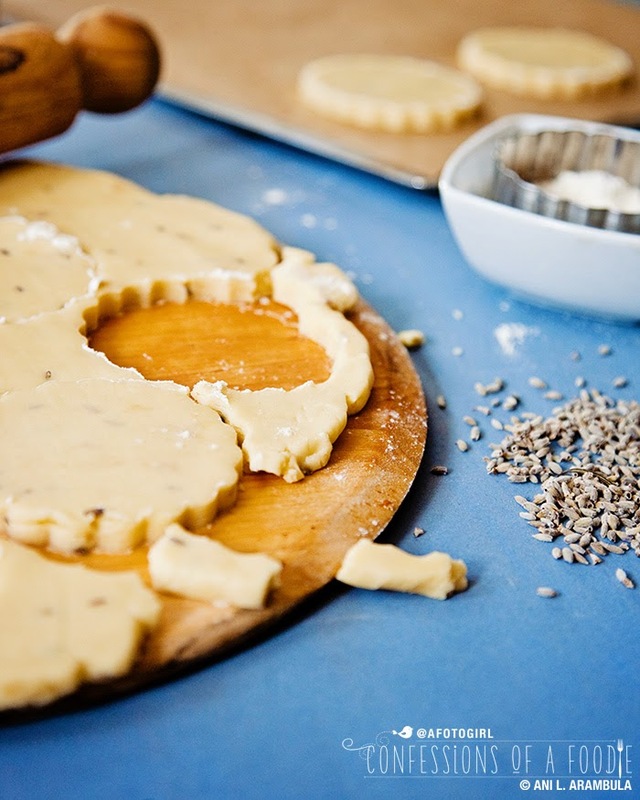 Use a 3” round cookie cutter to cutout the cookies placing the cuts as close as possible so as to cut down on the amount of re-working the dough as possible. Place on line cookie sheet. Depending on the size of your cutter, you should be able to get 20 to 24 cookies. 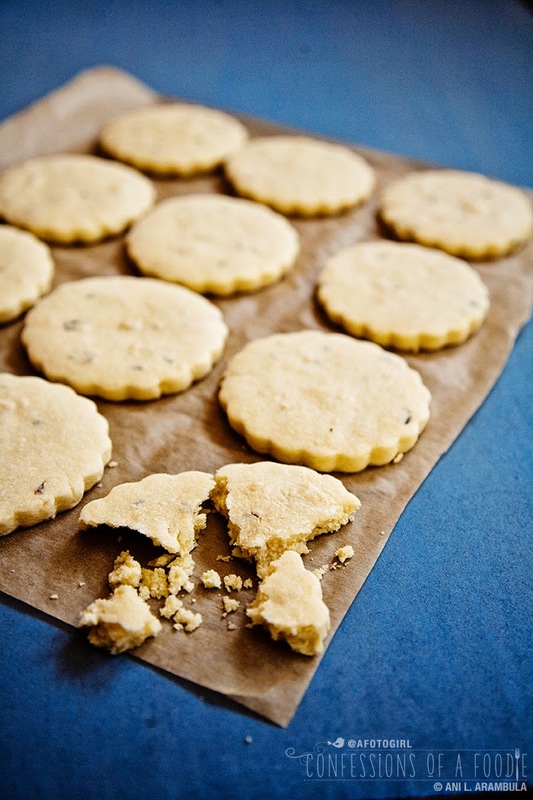 Optional: poke holes in the cookie with a fork (just once per cookie) to keep the cookies flat during baking. Bake for 18 - 20 minutes. Cookies will still be white, but set (they won’t rise). Let cool on parchment to set up, about 10 minutes. As always, comments are welcome! 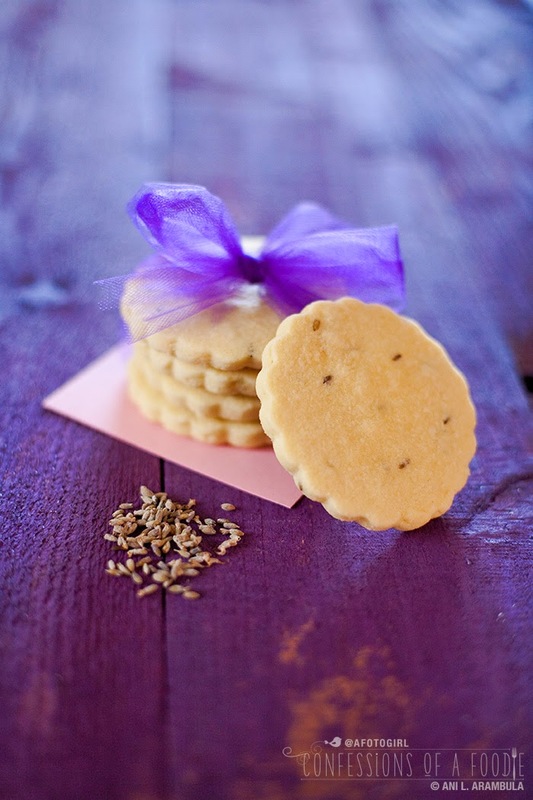 Do you cook with lavender? What's your favorite recipe? Funny you should post these - I found a bag of edible lavender last night.